Say thanks to your employees and clients with a gift they won't be able to stop talking about! Sure to impress, we offer a variety gift packaging options to meet all of your company's needs. We offer local delivery options within the DFW area (click here for a list of zip codes) and nationwide shipping options as well! So, no matter where you are, we can get a delicious holiday gift to your clients. All of our products are 100% hand made and decorated. Feel free to browse our flavors menu and check out our custom holiday collections. We can do corporate logos on our Cake Bites as well! 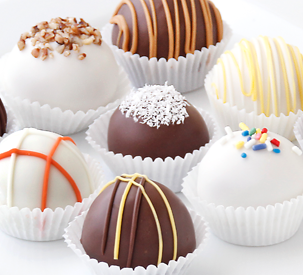 For our national customers, our cake balls are sold by the dozen only (due to specialty packaging required during shipping) and shipped out via FedEx. Gift packaging is available. For our local customers, we have a few additional options including favor packaging (1 or 2 cake balls per package). Look through our website and holiday gift guide below and let us know when you are ready to order! Feel free to order online, email us with your order, or give us a call at 214-449-8747. Wishing you a happy and delicious holiday season!